Here you can find all info about Afghani Gold from Spliff Seeds. If you are searching for information about Afghani Gold from Spliff Seeds, check out our Basic Infos, Gallery, Degustation, Strain Reviews, Shop-Finder and Price Comparison, Lineage / Genealogy, Hybrids / Crossbreeds, User Comments or Threads for this cannabis variety here at this page and follow the links to get even more information - or list all Afghani Gold Strains (±2) to find a different version. If you have any personal experiences with growing or consuming this cannabis variety, please use the upload links to add them to the database! 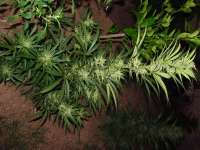 Afghani Gold is a mostly indica variety from Spliff Seeds and can be cultivated indoors (where the plants will need a flowering time of ±60 days) and outdoors. 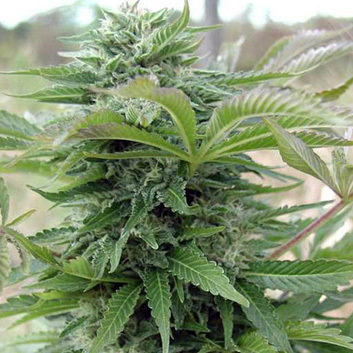 Spliff Seeds' Afghani Gold is/was only available as feminized seeds. We used our Afghan as a mother and our Skunk no.1 for pollen production to create our Afghani Gold. By using the Skunk no.1 we were able to improve yield. She is a 90% Indica with a high level of THC. She is a short, Christmas tree-like plant. Afghani Gold is highly tolerant to irrigation and fertilization. Seeds will usually rise above ground within 3 to 4 days. There is little to no variation between individual phenos, especially when it comes to yield. The main buds are stretched, thick and solid. Side buds are also solid, but small and few in numbers. Afghan has a good flower to leaf ratio. She has very few leaves, but lots of calyxes covered in trichomes. She is therefore easy to trim. When grown to fruition she smells like grade quality Afghani hashish. Afghan has a sweet, fruity and earthy flavor and has a narcotic, Indica buzz. Medicinal value: nausea, insomnia and spasms. Genotype: Afghani #1 x Skunk no.1. Hashish aroma and fruity, earthy flavor. Highly tolerant to irrigation and fertilization. Short stalked and one main, stretched bud. Medicinal value: nausea, insomnia and spasms. Where to buy Afghani Gold cannabis seeds? Afghani Gold from Spliff Seeds is available only as feminized seeds. Regular seeds are not available at the moment. In 7 seedbanks, we found 24 offers between USD 5.48 for 1 feminized seed and USD 1132.91 for 200 feminized seeds. If you are looking to buy Afghani Gold Cannabis Seeds from Spliff Seeds somewhere - have a look to our Afghani Gold Price Comparison page with all current offers from all the connected seedbanks and shops - or visit one of the following tested, trustworthy and recommended seed-shops directly to check out their current Afghani Gold offers: Spliff Seeds, Indras Planet GmbH, Herbies Head Shop, Original Seeds Store, Samenwahl.com, Cannapot Hanfshop and Discreet Seeds. We've collected strain info from one grower for Afghani Gold. Afghani Gold gets 8.00 of 10 possible Points in the average! 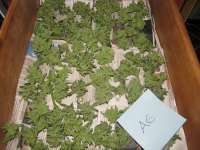 The seedfinder users tested Afghani Gold and uploaded information about the aroma, taste and effects of Spliff Seeds' Afghani Gold. Here a short overview, click to the charts or links to get an exact description and find similar cannabis varieties! Here you see the latest Afghani Gold photos, uploaded from our users! Altogether we've collected 5 pictures from Spliff Seeds' Afghani Gold, check out our Afghani Gold gallery to view them all. Had this plants for my second indoor grow (10years ago)! First time i used a PH & EC meter :) real difference! I think this plants can take lot's of beginners mistakes.. it's very stong and keeps goinig. Very Indica like with some skunk influences, quitte a good yielder seed my pic. High is very narcotic an couchlocking. Would grow again in future. Do you know something more about Spliff Seeds' Afghani Gold? Please help to make this database better and upload/connect your information here!